If you've ever considered turning a hobby into a business, then this story is for you. Lisa Polderman (aka PoldaPop Designs) was given an old sewing machine in 2009. After leaving her intense job to become a stay-at-home mom, she decided to dust off the machine and take lessons. That was in 2010. Since then she's grown a small, but thriving, business creating custom-fitted skirts, dresses and accessories for local clients (Lisa lives and works in Berwyn, IL). Lisa is, essentially, a tailor - remember those??!! Most of her work is custom. Everything is unique. And when she has 10 spare seconds (!) she makes unique things to sell in her Etsy store ("like" her on Facebook right now and get a free shipping code). Beautiful, unique things. So I'm promoting an inspiring small business, but where's the ReFab you ask??? "When I was a kid, I had a barbie doll that could be blonde or brunette with just a twist of her scalp. I think that's where my fascination with reversible things started. The main colors in the bag are tangerine orange and purple. The fabric on side one is Kaffe Fassett Collection 2010 Hot Line Dance Red. 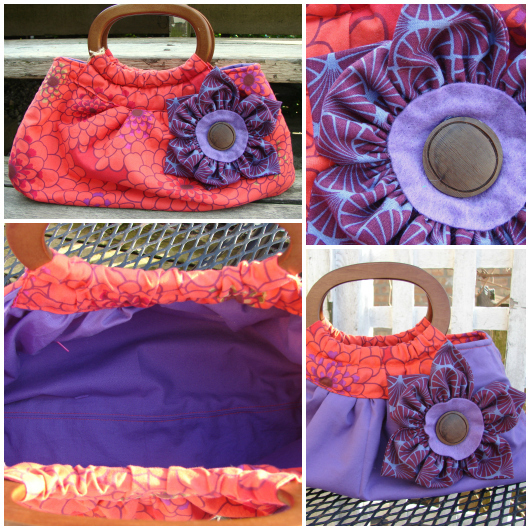 The fabric on side two is a muted purple cotton fabric with tangerine orange topstitching. The bag is constructed of quilting cotton and reinforced by Thermolam Fleece to give the bag weight and structure. The handle is wood. The bag has a zippered pocket on side two featuring a hot pink zipper. The Kanzashi flower is made of Joel Dewberry Heirloom Empire Weave Garnet fabric, felt, and a vintage jacket button with a brooch pin to attach it to the bag or anything else. This bag is the perfect size for carrying a book, wallet, keys and other essentials, or a diaper, packet of wipes and the essentials. This reversible bag measures 17” (43cm) wide at the bottom and narrows to 13" (33cm) wide at the top. The bag is 8.5" (22cm) high not including the handle. The colors are orange-red and purple with red and pink accents. You'll find that my bags are very well made. All my bags are made by hand by me in my smoke-free workroom. Measurements are approximate. Colors may appear differently on your computer monitor. Spot cleaning recommended." 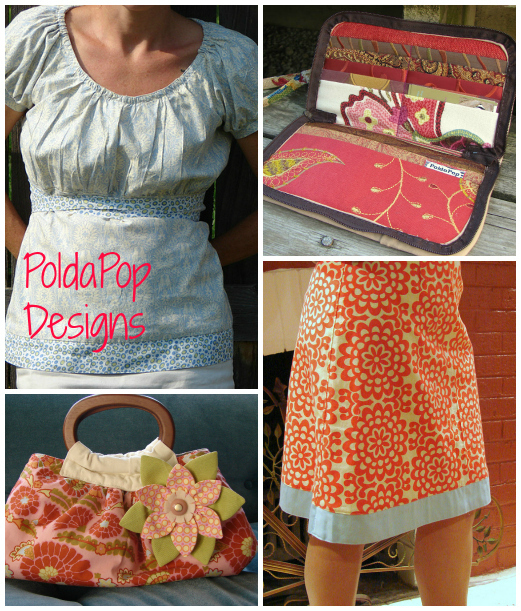 76 comments on "Giveaway: PoldaPop Designs! " Such a cute purse! I love the story behind this giveaway! Her store has such cute stuff! Great place to shop for Christmas!!! This is a super cool purse! Love it! Thanks so much for offering this for a giveaway! It's so cute! What a great giveaway! This purse is such a cute accessory! I won't want to take it off! Thanks, this bag looks beautiful. I adore that purse! Your tweet doesn't have the right giveaway on it though :) Just letting you know! 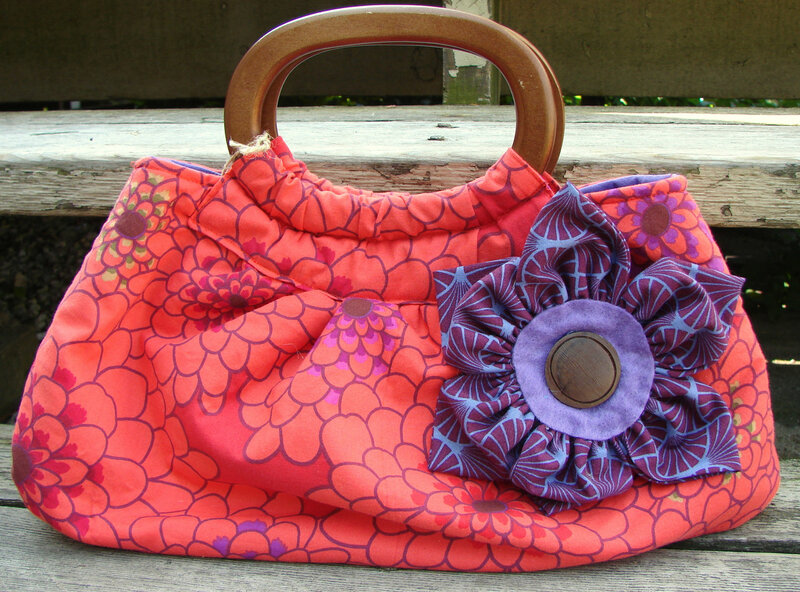 I love this reversible bag.Its so beautiful and well crafted.I love the purple inside! I really like that bag. This is a super cute bag. I love that it's reversible. How versatile! Thank You for this giveaway!Lovely! Oh wow, I love bags of any sort and this one has my two favourite features: it is reversible and it has my two fave colours, red and purple! I am a follower of poldapop blog and refab diaries for a long time now. I love reading Lisas's tutorials and posts. Purple is my favourite color and orange my best buddies'. It would be awesome if I would win this. Thanks for the giveaway.. I love her choice of fabrics. As a full time working mother of two children under two years old, Lisa's story makes me so happy! It's my dream to find a way to stay home with my children while still contributing to my family's income. It's great to read about other women who are doing just that! Oh the fabrics are pretty! I'd love to win this! I love the colors in this purse, they just make me feel so happy and cheery. I love the vibrant colors of this purse! Beautiful! Would love to win!! Beautiful! Thank you for the opportunity! I love it, what a cute purse! And the fact that it is reversible makes it even better! I love the fabric flower accent. I've just now started caring about what my purse looks like. Love this! Oh wow it is so beautiful!!! what an adorably perfect purse! I'll have to fight off daughters if I win! What a cute bag! Thanks for the giveaway! super cute giveaway! I love this! Awesome purse! Thanks for the opportunity!!! I love this bag! Thanks for giving us a chance to win it! Cute purse! I love the colors. What a wonderfully charming purse! Cute, cute handbag - thanks for a generous giveaway! I love the bag! It's so pretty and unique! super cute would love to win!! This is darling...thanks for the chance. It's a beautiful bag! I love it!!! Absolutely adorable stuff! Her wallets are fabulous! I liked the description of this purse. I really like the vivid colors. Purple is a big color among the females in our family. Thanks for the giveaway!